What will Moscow and Jakarta try to hide from the CIA? 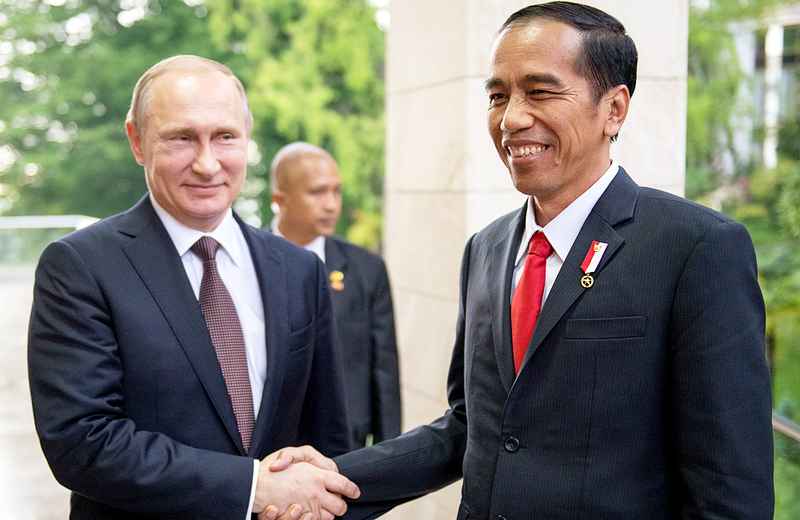 Vladimir Putin and Joko Widodo on a meeting in Sochi on May 18. A new cooperation agreement between the Russian and Indonesian intelligence agencies bodes well for both countries. It also suggests that Moscow and Jakarta may have learned from the bad experiences of the 1960s, when the CIA got access to classified information on Soviet arms deliveries to Indonesia. Russia and Indonesia have signed an agreement on the exchange of intelligence information and enhancing contacts between law enforcement agencies. “We are interested in the establishment and further development of cooperation in overcoming challenges and threats, primarily in the field of counter-terrorism,” Indonesian President Joko Widodo told reporters after extensive talks with Vladimir Putin in Sochi on May 19. What specific data from Indonesia interests the Russian intelligence establishment is a matter of debate. Jokowi, however, clearly stated that the countries would cooperate in the fight against terrorism. Indonesia has the biggest Muslim population in the world and is a constant target of terrorist attacks. In this struggle there is a dearth of information, so Russia is very much interested in such data from Indonesia. The quality, reliability and utility of such information will be appraised on a case-by-case basis by experts, who will compare it with inputs from other sources. Oddly enough, Indonesia was the first country in the region to sign such an agreement with Russia. Even Vietnam has not yet signed such an agreement with its longstanding ally. One of the less obvious reasons behind the signing of this agreement could be Indonesia’s desire to diversify its military and intelligence ties and gradually withdraw from the CIA and the Australian intelligence services. This aspiration is derived from the principle of neutrality, which is followed by Indonesians in their international policies. However, in order for this to happen, both Moscow and Indonesia must take into account the bad experience in the 1960s, when the CIA got access to information about the delivery of Soviet arms to Indonesia. President of Indonesia Dr. Ahmed Soekarno inspecting the Moscow Kremlin in June 1961. In the 1960s Indonesia, led by then President Soekarno, was involved in several conflicts with its neighbors. In a relatively short period of time Indonesia evicted the Dutch colonizers from the Western part of the island of New Guinea and then launched ‘Konfrontasi,’ an undeclared war on Malaysia. The conflict ended three years later with Indonesia recognizing the formation of Malaysia. Soekarno had the military support of the Soviet Union, which was attracted by the Indonesian leader’s socialist leanings. Jakarta received arms worth several billion dollars from the USSR. It is believed that a decisive factor in the defeat of the Dutch in Western New Guinea was the presence of dozens of Soviet submarines around Papua New Guinea. The Soviet presence blunted the Dutch Navy, whose ships were stuck at the ports. A few years later, under President Suharto, Portugal was forced to leave East Timor, which became an independent country in 2002. Looking to take advantage of the conflicts in the region, the CIA launched Habrink, a large-scale operation in Indonesia. The aim of Habrink was to collect information about all the weapons that the Soviet Union was transferring to Jakarta. Indonesia’s counterintelligence during that period was in its infancy. It consisted mainly of ethnic Javanese former officers of the erstwhile colonial Dutch army. The CIA managed to bribe the Indonesian officers, who gave them documents and information about Soviet weapons. In the mid 1970s CIA operative David Barnett, who worked at the U.S. Consulate in Surabaya during the Soekarno era, managed to recruit Soviet citizens. After retiring from the CIA, Barnett moved to Indonesia and opened a shrimp plantation, which went bankrupt. He then sold the data about Operation Habrink to the KGB for $100,000. In 1979, he was betrayed by a KGB defector, who was recruited by the CIA in Indonesia. Barnett was sentenced to 18 years in prison, but in 1990 he was released on bail. These stories are talked about to this day in the intelligence community. Moscow now wants to protect itself from repeating the mistakes of the past. The CIA would definitely be interested in Russian weapons that are being exported to Indonesia. What could interest the CIA now? The CIA may be interested in many of the details that always accompany large-scale contracts for the supply of weapons: the financing schemes, intermediaries, meeting places, and transport ships. And the Russian side would like Indonesia to at least inform it about any possible attempt by the CIA to recruits officials involved in Russia-Indonesia defense matters. If the Russian and Indonesian sides make efforts, then they may be able to maintain the desired mode of secrecy surrounding arms transfers. In Latin America, this was not possible. An intelligence cooperation agreement is not always accompanied by contracts for military supplies, so Indonesia can claim that it is not violating its principle of neutrality. The obvious problem in the country is turmoil in the Indonesian intelligence services. Appointments to key positions are sometimes conducted on the principle of personal loyalty and favoritism. In addition, Indonesian counter-intelligence is still being used mainly to solve internal problems, not to ensure secrecy and counter-intelligence activities in the truest sense of the word. The Russian-Indonesian agreement contains a number of additional points, which are now common to all intelligence services in the world. First and foremost we are talking about the economic aspects of intelligence services and ensuring corporate information security. Multibillion-dollar civil contracts in the oil and gas sector and railway transport also require this level of secrecy. Another matter that should not be overlooked is the safety of merchant and fishing vessels in Indonesian waters (especially in the Strait of Malacca). The threat of piracy in the region is as high as it is in the waters off Yemen and Somalia. Thus, the agreement on the exchange of intelligence between Russia and Indonesia is very promising. But it is also important that the agreement is implemented and functioning, going beyond just words.